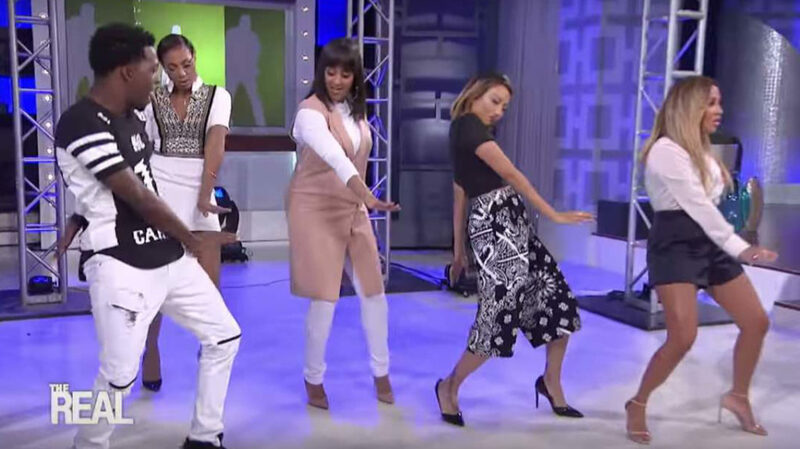 The Memphis rapper iLoveMemphis formerly known as iHeartMemphis stopped by “The Real” daytime talk show and showed the ladies of the popular talk show how to do his viral “Hit The Quan” dance. The rapper who changed his name after signing a deal with RECORDS, a new independent record label in partnership with Barry Weiss and SONGS Music Publishing and in association with Palm Tree Entertainment and Rush Hour Entertainment, can be seen in a video teaser of “The Real” which was a teaser for today’s airing of the show. In the short video clip, the ‘Hit The Quan’ sensation revealed that up until four months ago before becoming an Internet sensation he was working as a security guard. All the talk show co-hosts including Tamar Braxton, Tamera Mowry-Housley, Loni Love, Jeannie Mai and Adrienne Bailon were doing their thing on the stage but one really seemed to be ‘getting down’ and that’s Jeannie Mai, watch the video and keep an eye on her!